PRESIDENT Robert Mugabe has threatened to introduce tough and rigid media laws accusing the press of lying and writing fiction about him. Mugabe was speaking at the luncheon of the third session of the 8th Parliament. He said standards of journalism in Zimbabwe have deteriorated to alarming levels as the scribes are writing lies about him creating fights within his party and at times setting him against his former deputy, Joice Mujuru. “This is not the journalism that we would like to see. Vanyanya (They have gone too far)… they even write things that I have not thought of… haa,” he said. “When we start being rigid and take control don’t cry foul. We want freedom but not this. They are busy setting party leaders against each other. They love to see people fighting. “They write so and so is fighting so and so, no no no… zvanyanya (It’s too much),” he said. “They write what someone did not say… they even interpret things and give them a meaning. 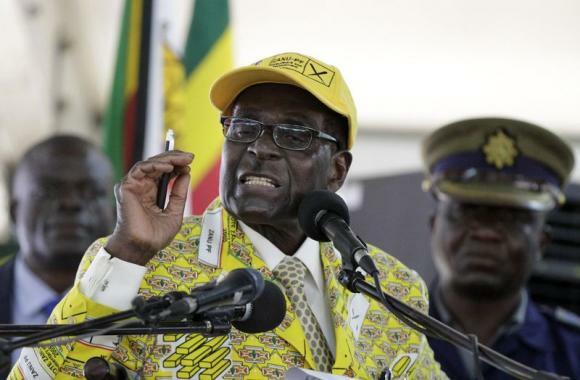 I know we want the freedom yes, you can criticise me but don’t give me sins I did not commit,” Mugabe said. “Right now they are saying I am afraid of mai Mujuru (Joice). “She made a mistake and we disciplined her, now they are propping her up as if she has done anything meaningful. Hahaha! You are saying that I am afraid of her. This fist do you know it? Where is Ian Smith?” asked Mugabe rhetorically. Since towards the 2014 December congress, Zanu PF has been in the news with reports of fierce infighting. Clear factions have emerged with one led by vice president Emmerson Mnangagwa and the other by his predecessor Joice Mujuru. Although Mujuru was fired from the party alongside her alleged supporters, many within Zanu PF reportedly still back her. Mnangagwa has also been under spotlight of late following his statements in the New African magazine suggesting that the late Vice President Joshua Nkomo was a sell-out.